It’s incredible, but true: Americans are inundated with more than 5,000 advertising messages every day. Television commercials, online ads, store signage, email marketing, and outdoor billboards, to name just a few, are making it harder than ever for shoppers to cut through the advertising clutter. A logo is, without a doubt, the most important branding element in all of these marketing efforts. It is often the first impression that customers have of your small business, so it needs to look professional and communicate what your business is about. So, how can you create a new logo, or redesign an existing logo, that contains all of the tried and true branding elements? This Balboa Capital blog post answers that question; it features four small business logo design tips. It’s easy to come up with a logo idea that is similar to what is already out there. However, this approach won’t set you apart from the competition. In fact, it might create confusion among the target audience that you and your competitors are both going after. So, make a list of competing businesses and write down a brief description of their logos, and what makes them different. You can find your competitors’ logos easily by looking them up online. After you are finished with this exercise, think of logo styles, colors, and fonts that communicate your brand personality and create an emotional connection. If you hire a graphic designer, you can skip this step, as they will come up with ideas for you. Remember, there is no one style that is right for every small business, only one that is best for your brand. You probably put a lot of time and effort into naming your small business. So, don’t cut corners when it comes time to get a business logo developed. Hire a graphic designer to get the job done right. 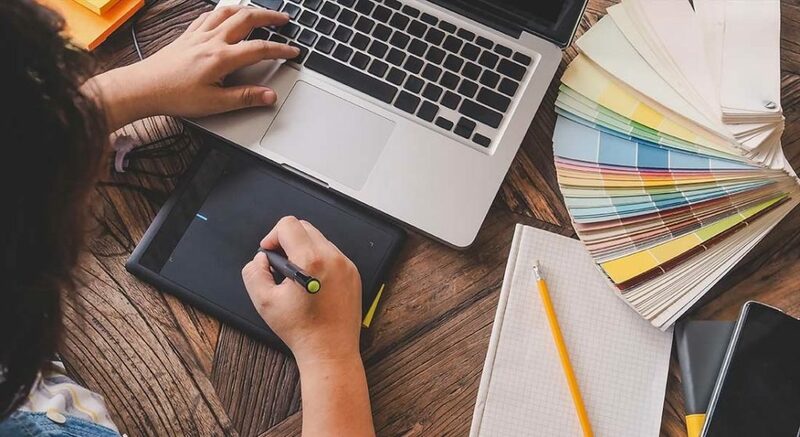 Graphic designers are uniquely trained in all facets of logo design and typography, and they create logos based on a company’s marketing strategy and branding. There are a number of freelance graphic designers who have websites that showcase their work. When you find a few designers who might be a good fit, contact them to ask about their design process, fees, time frames, and terms and conditions. Once you approve your logo, ask your graphic designer to save it in a variety of different sizes and formats. This will save you time when you need to add your logo to your website, social media profiles, stationery (letterhead, envelopes and business cards), store signage, and promotional products. Don’t expect the perfect logo to appear on the first draft. Creating a business logo is a very involved process, no matter how simple the design is. Keep this in mind when you receive the initial logo concepts from your graphic designer. When reviewing the logo designs, resist the temptation to think you are a graphic design expert. Instead, appreciate the creative process and remember that your graphic designer is presenting you with logo ideas that are relevant to your brand and deliver on the expectations in your creative brief. Provide positive feedback and recommendations to your graphic designer in a timely manner. However, try not to overwhelm them with too much input, or an excessive amount of design changes. 4. Trademark your business logo. Hiring an intellectual property (IP) attorney to register your company’s logo with the U.S. Patent and Trademark Office will provide you with peace of mind. A trademarked logo protects your business name and logo mark, and gives you the exclusive right to use it in a specific geographic area. In the event that another company uses your trademarked logo, you could be entitled to monetary damages. Lastly, having a trademarked logo eliminates the chances of infringing on another company’s logo, which can end up being quite costly. In addition to expensive legal fees, you might have to pay fines, punitive damages, or even change your company’s name. In summary, trademarking your logo is a small investment that is definitely worth making.